Tracto-Parts Center Inc.We are your source for the finest manufactured engine parts including all your forklift parts and over 10 years customer satisfaction. 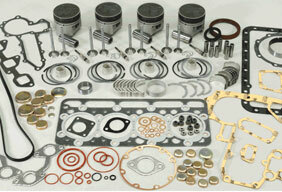 You will find professional and knowlegable personal eager to assist you in all your parts needs. Quality products and service second to none! Tracto parts center, inc. covers engine hard parts application for the tractor, combine, heavy duty, construction and forklift markets. Our new replacement engine parts include Caterpillar® (Peugeot®), Mazda® (yale®), Mitsubishi®, Nissan®, Perkins®, Toyota®, and Waukesha® forklift application as well as Case®, Ford®, Massey Fergusson® and IHC® tractor /combine applications. We have also expanded to industrial on our new Bobcat®, Kubota® Yanmar® and Case® line. We are the tractor, forklift, construction and industrial professional’s choice! Discover for yourself here at Tracto-Parts Center, Inc. We deliver what others just promise! We thank you for your interest and look forward to serving you in the near future. © 2009 Tracto-Parts Center Inc. All Rights Reserved.